The Victors, a U-M student programming team, competed in the 2018 ACM International Collegiate Programming Contest (ICPC) World Finals in Beijing, China, on April 15 - 20, 2018. 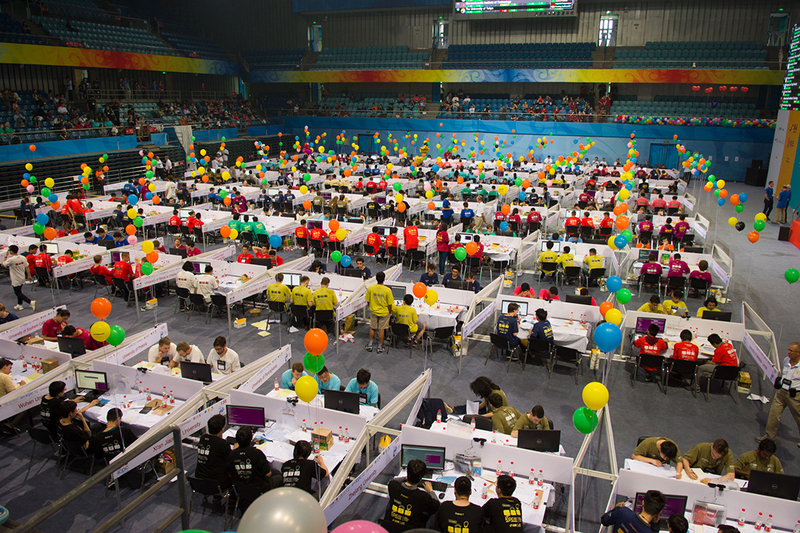 The ACM-ICPC is the largest and most prestigious computer programming competition in the world. The competition pits teams of three university students against eight or more complex, real-world problems, with a grueling five-hour deadline. Huddled around a single computer, competitors race against the clock in a battle of logic, strategy, and mental endurance. The U-M team, including Nathan Fenner, Aman Karunakaran, and Lawrence (Larry) Wu, placed 56th out of the 120 teams that advanced to the world finals. Over 46,000 students worldwide had competed in regional competition for the honor of participating in the world finals. To reach the world finals, the Victors competed in the 2017 ACM East Central North America Regional Programming Contest, where they placed fourth out of the 140 teams that participated. During the world finals, the teammates collaborated to rank the difficulty of the problems, deduce the requirements, design test beds, and build software systems that solve the problems under the intense scrutiny of expert judges. The Victors were able to solve four out of nine problems correctly. The U-M programming team was coached by longtime programming team coach Prof. Compton. Assistant coaches were CSE graduate student Yujie An (who was on UM teams that advanced to World Finals in 2014 and 2015) and U-M alumnus Dennis Matveyev, who has assisted with training for many years. Click here to view pictures of the competition, courtesy of Dennis Matveyev.